This movie freaked me out as a kid. It kind of freaks me out now. Try Ghost Notes, the award-winning novel, in print form for just $5. 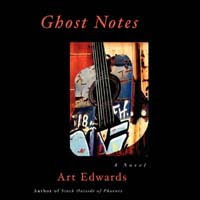 Try Ghost Notes the Audio Book as an unabridged digital download for just $4.99. Or try Ghost Notes the 99 cent Ebook. The last six months have brought much goodness for me, so let's hit it. 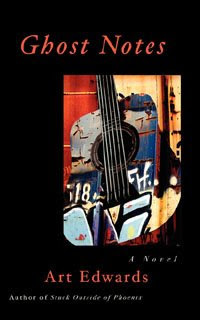 First and foremost, my third novel Badge, which I completed at the beginning of the year, was a finalist in the Pacific Northwest Writers Assocation's Literary Contest for 2011. There were over 1,000 entries in twelve different categories, and my category, Mainstream, was the most popular. It was an honor to be in the final eight. Hopefully this means some agent or publisher will get off her duff and take this novel on. I'm still actively beating the industry over the head with it. As always, I hope to have more to report soon. Also, the movie version of my first novel Stuck Outside of Phoenix is underway! Director, Producer, Mr. Everything Nico Holthaus is starting preproduction in Phoenix this month with principle photography (whatever that is) scheduled to begin November 2nd. Look for the thing to be in the can by April 2012, when there will be much rejoicing. Keep your eyes peeled here for the occasional update on the movie and more (or when there's no news, a random video of the week). In celebration of the commencement of the filming of Stuck, two things have happened: 1) Stuck Outside of Phoenix the book-book is again in stock at my website! For a mere $5 plus shipping, you can have a signed copy delivered to your door. Also, Stuck the ebook versions at both Amazon and Smashwords have been reduced to 99 cents! I must be out of my mind to offer these prices, which of course I am, so there you go! Finally, real-life paper versions of both Ghost Notes and Stuck Outside of Phoenix are now for sale at a real-life bookstore here in Portland! Yes, if you're one of those archaic folks who prefers to buy books during an actual trip to a bookstore (me), you can get mine at Broadway Books in NE, the best little bookstore in town. Give them a try! I've had many pieces published since my last communicado, among them a piece at The Writer about my struggles with the memoir form; a short, fun piece about falling out of love with a song at Girls with Insurance; and many TNB posts. Also, there now exists an interview with me at TNB by the inimitable Gloria Harrison! We talk Badge, the Refreshments and of course, senior discount food joints. Take a gander, lest you go unentertained today. That's it. As always, keep apprised of all thing me at my website, my blog, my Facebook page, or any of the thirty of forty other places I do my best to update on the web. Drop me a line if we haven't touched base in a while. Have a fab fall, folks! The only band from the 80s they'll care about in 100 years. A taste for those of you waiting for my third novel, Badge.